So now we turn to the most discussed of all the 1950s computer games: Tennis for Two, designed by Willy Higinbotham and largely built by Robert Dvorak at the Brookhaven National Laboratory (BNL) in 1958. Unlike the games discussed previously, Tennis for Two was built specifically to entertain the public rather than just to demonstrate the power of a computer or train a group of students, giving it some claim as the first true computer “game” from a philosophical standpoint. That is certainly the contention of BNL itself, which dismisses NIMROD and OXO as programming demonstrations rather than entertainment. Ultimately, this debate matters little, as Tennis For Two only existed briefly and did not influence later developments in the industry. While Tennis for Two did not inspire later designers, however, it did gain a new notoriety in the 1970s when lawyers for arcade companies defending against a patent lawsuit brought by Magnavox discovered the existence of the game and unsuccessfully attempted to portray it as an example of prior art that invalidated Ralph Baer’s television gaming patents. Higinbotham was called to testify on multiple occasions during various patent suits that continued into the 1980s, which is one reason the game is far better documented than most of its contemporaries. The game also received public recognition after Creative Computing ran a feature devoted to it in October 1982 because the magazine’s editor, David Ahl, had actually played the game at Brookhaven back in 1958. As a result of this article, Tennis for Two was considered the first computer game until more in-depth research in the late 2000s uncovered some of the earlier games listed in the previous post, and the early monographs such as Phoenix, High Score!, and The Ultimate History of Video Games accord the game pioneering status. Even though newer works like Replay and All Your Base Are Belong to Us acknowledge earlier programs, however, they continue to give Tennis for Two pride of place in the early history of video games due to it arguably being the first pure entertainment product created on a computer. Before diving into the game itself, we should examine the man who created it. According to an unpublished account now hosted at the BNL site that he wrote in the early 1980s supplemented by a deposition he gave in 1985, William A. Higinbotham graduated from Williams College in 1932 with a bachelor’s degree in physics and spent eight years working on a Ph.D at Cornell that he ultimately abandoned due to a lack of money. Higinbotham first worked with an oscilloscope during a senior honor’s project at Williams and spent his last six years at Cornell working as a technician in the physics department, which gave him the opportunity to learn a great deal about electronics. 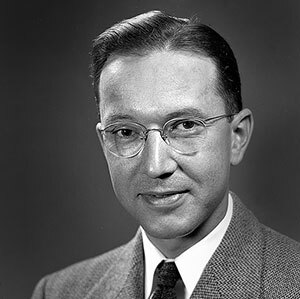 As a result, he was invited to MIT in December 1940 to work on radar at the university’s Radiation Laboratory, where he concentrated on CRT radar displays. In December 1943, Higinbotham transferred to Los Alamos to work on the Manhattan Project, where he was quickly promoted to lead the electronics division and, according to Replay, worked on timing circuits. He left Los Alamos for Washington, DC, in December 1945, where he spent two years doing education and PR work for the American Federation of Scientists, a group that worked to stem nuclear proliferation. In 1947, he came to BNL, where he became the head of instrumentation in 1951 or 1952. The above provides a solid overview of Higinbotham the scientist, but Harold Goldberg in All Your Base Are Belong to Us also gives us a portrait of Higinbotham’s less serious side. According to Goldberg, who drew his information from a profile in Parade, Willy was a natural entertainer who called square dances, played the accordion, and led a Dixieland band named the Isotope Stompers. He also exhibited a penchant for making technology fun, once attaching a sulky and two wagons to the family lawnmower so he could drive his kids around the yard. Seeing this side of the eminent physicist, its no surprise that he would find a way to make a computer entertaining as well. Higinbotham created Tennis for Two as a public relations vehicle. Every year, BNL held three visitor’s days in the fall — one each for high school students, college students, and the general public — in which the scientists gave tours of the facilities and built exhibits related to the lab’s work in the staff gymnasium. Most accounts of the exhibits emphasize that they consisted of unengaging static displays, but in his 1976 deposition for the first Magnavox patent lawsuit, Higinbotham states that the staff always tried to include something with “action,” though he does not specify whether this included games. Therefore, Higinbotham may not have been the first person to liven up the event through audience participation, but he was still definitely the first person that decided to entertain the public with a computer game. 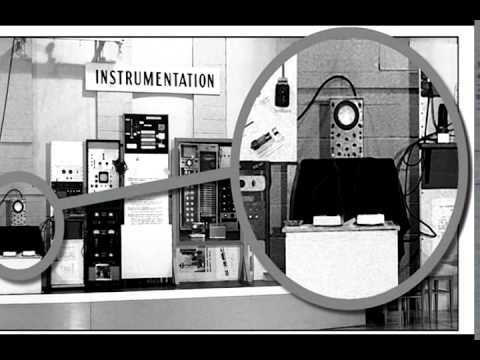 As the BNL website and his notes indicate, Higinbotham was inspired to create Tennis for Two after reading through the instruction manual for the lab’s Donner Model 30, a vacuum tube analog computer. The manual described how the system could be hooked up to an oscilloscope to display curves to model a missile trajectory or a bouncing ball complete with an accurate simulation of gravity and wind resistance. The bouncing ball reminded Higinbotham of tennis, so he sketched out a system to interface an oscilloscope with the computer and then gave the diagram to technician Robert Dvorak to implement. Laying out the initial design only took Higinbotham a couple of hours, after which he spent a couple of days putting together a final spec based on the components available in the lab. Dvorak then built the system over three weeks and spent a day or two debugging it with Higinbotham. The game was largely driven by the vacuum tubes and relays that had defined electronics for decades, but in order to render graphics on the oscilloscope, which required rapidly switching between several different elements, Higinbotham and Dvorak incorporated transistors, which were just beginning to transform the electronics industry. Tennis for Two‘s graphics consisted of a side-view image of a tennis court — rendered as a long horizontal line to represent the court itself and a small vertical line to represent the net — and a ball with a trajectory arc displayed on the oscilloscope. Each player used a controller consisting of a knob and a button. 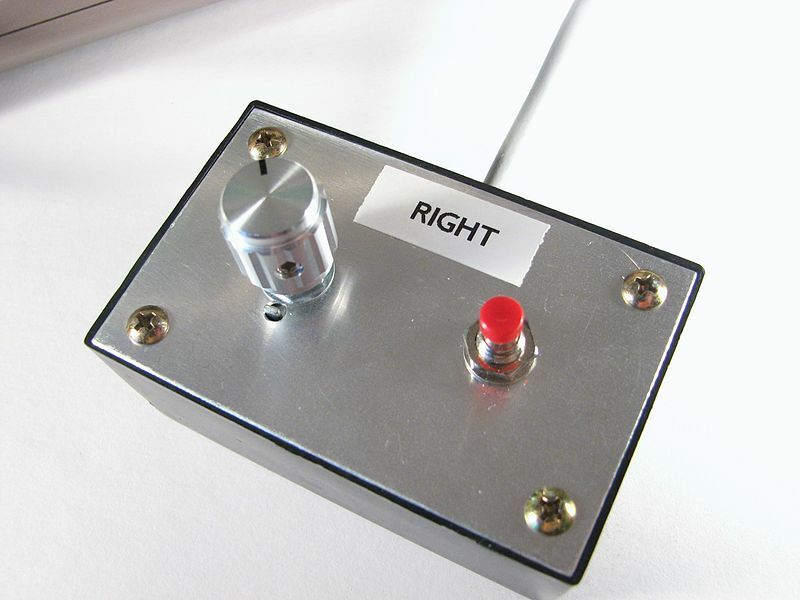 To start a volley, one player would use the knob to select an angle to hit the ball and then press the button. At that point, the ball could either hit the net, hit the other side of the court, or sail out of bounds. Once the ball made it over the net, the other player could either hit the ball on the fly or the bounce by selecting his own angle and pressing the button to return it. Originally, the velocity of the ball could be chosen by the player as well, but Higinbotham decided that three controls would make the game too complicated and therefore left the velocity fixed. According to Higinbotham, Tennis for Two was a great success, with long lines of eager players quickly forming to play the game. Based on this positive reception, Higinbotham brought the game back in 1959 on a larger monitor and with more sophisticated gravity modelling that allowed the player to simulate the low gravity of the Moon or the high gravity environment of Jupiter. After the second round of visitor days, the game was dismantled so its components could be put to other uses. Higinbotham never patented the device because he felt at the time that he was just adapting the bouncing ball program already discussed in the manual and had created no real breakthrough. While he appears to have been proud of creating the game, he stated in his notes that he considered it a “minor achievement” at best and wanted to be remembered as a scientist who fought the spread of nuclear weapons rather than as an inventor of a computer game. And now with all the introductions and definitions out of the way, it is finally time to start talking history. First, a note of caution. This post on computer games in the 1950s will at times refer to this or that program as the “first” to model a particular game or mechanic, but this should be read as the first that we know of rather than as an absolute statement of origination. While many interesting games from this time period have been unearthed — and in some cases even been recreated to play on modern hardware — the games of the 1950s were largely confined to research labs run by universities, large corporations, and national governments and were not intended for mass distribution and/or public consumption. As a result, there is a high degree of likelihood that researchers created logic puzzles, board games, card games, military simulations, etc., that never received larger exposure and have long since been lost. With that one caveat in mind, here is a look at the first decade of video gaming. The first digital computers were completed in the early 1940s, but it would take nearly another decade for the first computer games to appear. A subsequent blog post will summarize the evolution of the mainframe in the 1940s and 1950s in more detail, but for the moment I will just say that the early computers were extremely few in number, tended to be dedicated to highly specific functions, were difficult to reprogram (if they could be reprogrammed at all), and lacked the capability to execute a stored program. Consequently, even if a researcher had felt a “simulation” or a “game” might have been useful in his work, there would have been little opportunity to create one. By the 1950s, however, computers had been commercialized and had become sophisticated enough to be set to a variety of tasks. As we shall see, one of those tasks was playing games. The 1950s have largely been ignored by the monographs covering the history of video games. Phoenix, High Score!, and the Ultimate History of Video Games all skip the decade entirely with the exception of brief mentions of Tennis for Two, while the more recent All Your Base Are Belong to Us devotes a rather substantial prologue to that game, but again ignores most of the developments of the period. Only Tristan Donovan’s Replay and Mark Wolf’s The Video Game Explosion — through a chapter by David Ahl — cover the 1950s in any depth. This omission is understandable for two reasons. First, the authors of these books are primarily interested in the growth of the video game as an entertainment product and pop culture phenomenon, while the majority of the programs from this period were research projects that were not made available to the general public. Tennis for Two actually served as a public spectacle, making it a more suitable topic for such a narrative. Second, because these projects stayed locked up in research labs and were usually dismantled or discarded when they had served their purpose, these early games usually did not spread beyond a few academics and therefore exerted little to no influence on subsequent games. Donovan and Ahl between them identify several games from this period, however, which I will now examine here. For the moment, Bertie the Brain, a custom-built computer financed by Rogers Majestic (a prominent vacuum tube manufacturer and one of the forerunners of Canadian media giant Rogers Communications), is the earliest known computer game actually implemented — although a small number of game programs may have been described and/or written earlier, most notably several early chess programs. (Note: The development of computer chess over the 1950s is a long enough tale on its own and will therefore be covered in its own blog post.) Unlike most subsequent games in this post, Bertie was not a research project, but was intended specifically to impress the public as to the potential of computers. 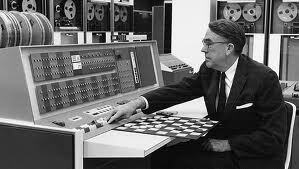 Bertie grew out of a project at the University of Toronto to build an early mainframe computer, the University of Toronto Electronic Computer, or UTEC. One of the earliest university-led electronic computer projects, UTEC design commenced in 1948, and a prototype was completed in 1950. The project was ultimately abandoned, however, when the university decided to purchase a computer from British firm Ferranti — a pioneering computer maker described in more detail below — instead. One critical member of the UTEC team was a University of Toronto Ph.D. candidate named Josef Kates. According to a profile on Bertie written by Chris Bateman for Canadian magazine Spacing in August 2014, Kates was born into a large Austrian Jewish family in 1921, but fled Nazi persecution in 1938, ultimately winding up in the United Kingdom. Kates enlisted in the British Army as an optician’s apprentice, but on the outbreak of World War II he was shipped to an internment camp in Canada due to his nationality. Finishing high school in New Brunswick, Kates eked out a living cutting wood, sewing socks, and repairing fishing nets until his previous lens experience landed him a job with Imperial Optical in 1941. He soon moved to Rogers Majestic to build radar tubes before joining the UTEC project after the war. One of Kates’s key contributions to the project was a device he devised in 1949 called the Additron, an electron tube that was smaller, less complex, and less power-hungry than the typical vacuum tubes of the day. The Additron ultimately never found its way into the UTEC nor did it enter mass production, as by the time a long and difficult patent process concluded in 1956, the technology was already obsolete. 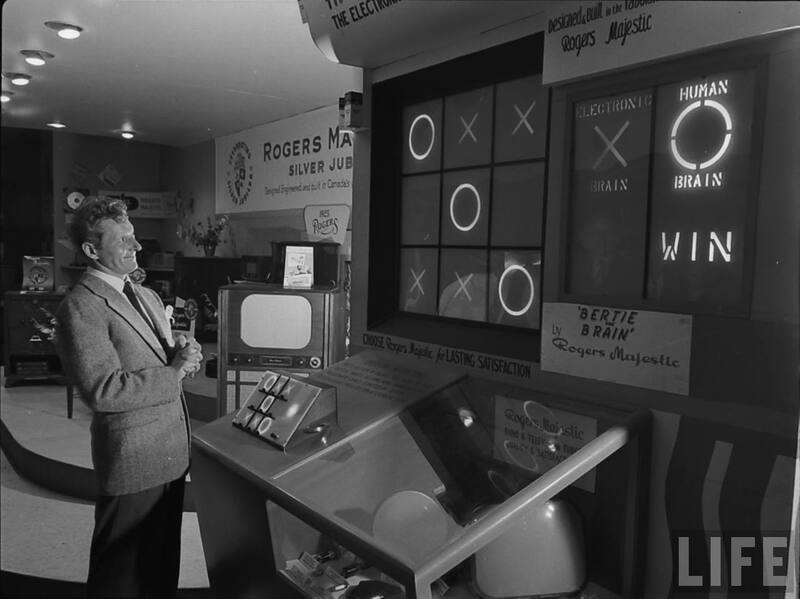 Rogers wanted to promote the technology during this delay, however, so Kates proposed creating a Tic-Tac-Toe game using Additron tubes for display at the Canadian National Exhibition (CNE). Unveiled at the CNE in the summer of 1950, Kates’s machine, dubbed “Bertie the Brain,” stood just over thirteen feet high and consisted of a custom-built computer, a lighted keypad for the player to input his move, and a lighted panel that showed the layout of the board and announced the winner. Once the player entered his move, Bertie countered nearly instantaneously and was virtually unbeatable, at least on the highest difficulty. Kates would often turn down the difficulty for children and then crank it back up for adults. The machine proved immensely popular, but it was dismantled at the end of the exhibition after serving its purpose. Bertie the Brain is not discussed in any video game history monograph written to date, but why it has been overlooked is not exactly clear. It was heavily publicized at the time, with Life Magazine even running a feature on Bertie that involved famed entertainer Danny Kaye challenging the machine and finally winning after the difficulty had been turned down multiple times. Kates himself went on to a long and distinguished career in the Canadian scientific community, and at least one newspaper article discussing his appointment to a new post written in 1975 referenced the creation of the game. A 2001 monograph by John Vardalas entitled The Computer Revolution in Canada: Building National Technological Competence also devotes a paragraph to the game. The recent article in Spacing has brought new attention to the game and its inventor, however, so this omission will hopefully be corrected in the future. With Bertie so far overlooked by the various monographs written about video game history, Donovan and Ahl both identify the NIMROD, a custom-built computer from British engineering firm Ferranti, as the first computer game. Like Bertie, NIMROD was built to impress upon the public the great potential of computers. Ferranti has the distinction of being one of the oldest companies to become involved in the nascent computer industry after World War II. According to a timeline made available by the Museum of Science and Industry in Manchester, Siemens engineer Sebastien de Ferranti established the company in 1882 to market a dynamo (an early electrical generator) of his own design. By the early twentieth century, Ferranti had become one of the most important power companies in the United Kingdom and was instrumental in the establishment of a national power grid. Defense work during and after World War II in fields ranging from gun sights to radar to guided missiles led naturally into first electronics and then computers, culminating in the launch of the Ferranti Mark 1 in 1951. While the UNIVAC I from Remington Rand is often identified as the first commercially available computer (see, for example About.com), the first UNIVAC I was delivered in June 1951 (Source: University of Pennsylvania, though some sources also claim the commercial deal was struck as early as March 31), while the first Ferranti Mark 1 was delivered to the University of Manchester in February (Source: University of Manchester School of Computer Science), making it the first commercially available computer by a matter of months (if we want to get really technical, the BINAC computer delivered to Northrop in 1949 was the first commercially sold computer, but it was a one-off unlike the Ferranti and Univac computers that were produced in quantity and made available to any interested party). According to Donovan, who apparently drew most of his material from the personal website of one Peter Goodeve, Ferranti found itself in a difficult position in late 1950: the company had promised to exhibit a computer at the upcoming Festival of Britain, but proved unable to honor the commitment. The Festival had been conceived by deputy prime minister Herbert Morrison as a “tonic for the nation” to demonstrate to the people of the United Kingdom that the art, technology, and ingenuity of the British people would heal the gaping wounds still remaining from the horror of World War II and help lead the world into a better tomorrow, making this an important public relations event for Ferranti. An Australian engineer named John Bennett who had worked on the pioneering EDSAC computer in the late 1940s ultimately provided a solution: Ferranti should demonstrate the mathematical capabilities of the modern computer and the fundamentals of computer programming to the public by displaying a custom-built machine that played the strategy game nim. According to Donovan, Bennett was inspired by the Nimatron, an electro-mechanical contraption displayed by Westinghouse at the 1940 World’s Fair. Donovan appears to have drawn this claim from a 2001 German article linked at Mr. Goodeve’s website. While this is a logical claim for the article to make, the author does not provide any proof from primary sources. Bennett himself appears to be silent on this point, at least in this excerpt from his autobiography. Again from Donovan and Goodeve, the NIMROD was built by Raymond Stuart-Williams between December 1950 and April 1951 and first exhibited at the festival on May 5, 1951. After the festival ended, the NIMROD was displayed for three weeks in October at the Berlin Industrial Show and subsequently dismantled. Lacking a monitor, the NIMROD used a series of lights as a display, which represented the individual pegs of the game. 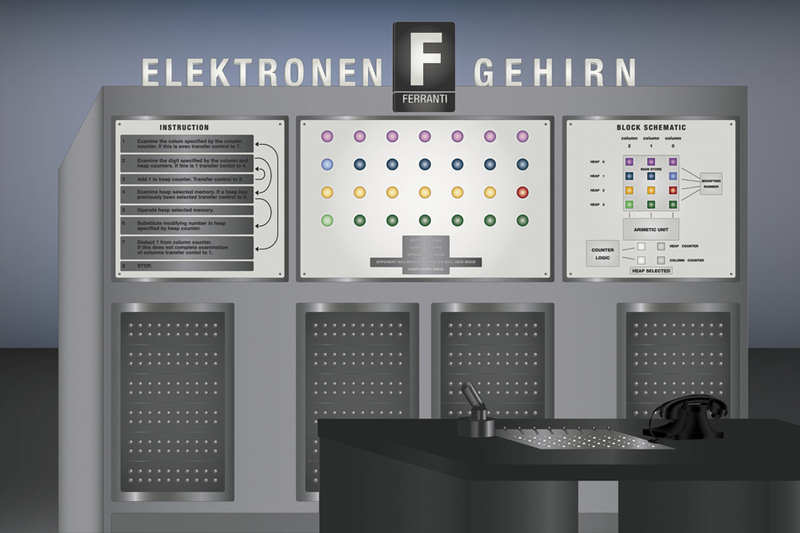 The human player chose which “pegs” to remove by pressing the corresponding buttons on a control panel situated in front of the machine. While NIMROD gave the public one of its first opportunities to play a game on and against a computer, Bennett was, in his own words, more interested in demonstrating programming algorithms and principles than in entertaining anyone. As such, neither Bennett nor Ferranti followed up on this ground-breaking machine. In The Essential Turing (2004), a collection of Alan Turing’s papers compiled by B.J. Copeland, Copeland writes that Strachey completed a preliminary version of his program by May 1951 and first tried to run it on the Pilot ACE in July, but was unsuccessful due to program errors. According to the IEEE Paper, that same month Strachey traveled to the University of Manchester to see the first Ferranti Mark 1 and consult with Turing, who had recently completed a Programmers’ Handbook for the machine. According to Copeland, Turing’s encouragement was crucial in Strachey finally getting the draughts program in working order on the Mark 1. 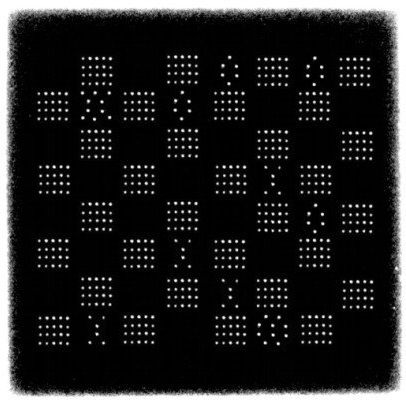 According to an article by David Link entitled “Programming ENTER: Christopher Strachey’s Draughts Program” that appeared in issue 60 of Resurrection, the official publication of the Computer Conservation Society, the game was finally completed in July 1952. That same year, Strachey described his game at a computer conference in Toronto, which, according to Copeland, directly inspired a programmer named Arthur Samuel to create his own version. An electrical engineer with a master’s degree from the Massachusetts Institute of Technology (MIT), Arthur Samuel was one of the more important pioneers of AI research in the United States. According to an article penned by John McCarthy and hosted by the Stanford Artificial Intelligence Laboratory, Samuel experienced his first brush with computing at the relatively early date of 1946 when he joined a team at the University of Illinois that began an ultimately unsuccessful project to build an electronic computer. According to McCarthy, it was during this project that Samuel first conceived of writing a checkers program that could defeat a champion player of the game to show just how powerful a tool a computer could be. In 1949, Samuel accepted a job at IBM’s Poughkeepsie Laboratory, where he was part of the team that designed the landmark IBM 701 computer. He remained at the company until retiring from the corporate world in 1966. According to Copeland, it was Strachey’s presentation in 1952 that rekindled Samuel’s interest in devising a checkers program, and indeed it was near the end of that year that Samuel completed an initial version on the 701, which Copeland surmises was the first AI program created in the United States. As related by both Copeland and Donovan, Samuel continued to refine this program over the next several years and accomplished a major milestone in 1955 when the program became capable of analyzing its own play and learning from its mistakes. As the program continued to gain notoriety, it was actually demonstrated on national television on February 24, 1956 (Source: IBM100, a centennial website created by IBM). According to McCarthy, IBM stock rose 15 points on the back of this demonstration. In Replay, Donovan claims that by 1961 Samuel’s program was “defeating US Checkers champions,” but this claim is exaggerated. According to McCarthy, in 1961 Samuel answered a call for submissions to the first anthology devoted to AI research, Computers and Thought, with a paper describing his checkers program. The editors of the collection, Ed Feigenbaum and Julian Feldman, suggested that Samuel include an account of his program’s best game as part of the article, so Samuel decided to challenge a champion player to a match. McCarthy states that the chosen player was “the Connecticut state checker champion, the number four ranked player in the nation,” but alas this also appears to be an exaggeration. The IBM 100 website identifies the player, one Robert W. Nealey, as a “self-proclaimed checkers champion.” Further digging shows that Mr. Nealey was indeed a checkers player from Connecticut, but his champion status derived from a tournament for blind chess players held in Peoria, Illinois, in which he claimed the title of “world blind checker champion” by default when no one else showed up to compete (Source: St. Petersburg Times February 26, 1980). Therefore, while the program, now running on an IBM 7094, did win its match against Nealey in 1962, this was not as impressive a victory as Donovan and McCarthy make it sound. Indeed, according to a webpage devoted to Samuel’s program maintained by the Department of Computing Science at the University of Alberta, Nealey actually won a rematch the very next year, while the program later lost eight out of eight games against two actual world-class checkers players at a world championship match held in 1966. Unlike the purely civilian research projects above, computer games simulating complex systems and interactions originated almost entirely within the military-industrial complex, which already had a long history of war gaming and systems simulation that predated computers. As this blog is focused on games created for entertainment rather than training, I will largely avoid discussing military and defense contractor projects, but I feel an overview of the earliest such games is appropriate as part of tracing the origins of computer gaming generally. In the Video Game Explosion, Ahl identifies the earliest military simulations as coming out of the RAND Corporation beginning in 1952. According to the company’s own website, Project RAND — short for “Research ANd Development” — originated as an outgrowth of advanced weapons research conducted during World War II and began in December 1945 as a collaboration between the Douglas Aircraft Company and the United States Army Air Forces (USAAF). As explained in RAND and the Information Evolution (2008) by Willis Ware, USAAF commander General “Hap” Arnold recognized that some of the most important military advances of World War II had been the result of collaboration between the military, academia, and industry, and therefore felt a joint project like RAND that was not completely under military control was essential to carrying this spirit of collaboration forward. In 1948, the newly established US Air Force chose to spin the project out as its own non-profit corporation. RAND employed mathematicians and scientists across a wide array of disciplines and contributed numerous breakthroughs in fields ranging from artificial intelligence to networking to space travel, but for now we turn our attention to the organization’s Systems Research Laboratory. As related in a RAND paper from October 1956 by F.N. Marzocco entitled The Story of SDD, the Systems Research Laboratory was the brainchild of RAND consultant John Kennedy, a psychologist who believed that RAND could not fully understand the impact of technology on the modern battlefield without also studying the “human factors” present in any interaction between man and machine. At Kennedy’s recommendation, RAND established the laboratory in May 1951 to undertake such studies, staffing it with a mix of psychologists and mathematicians. 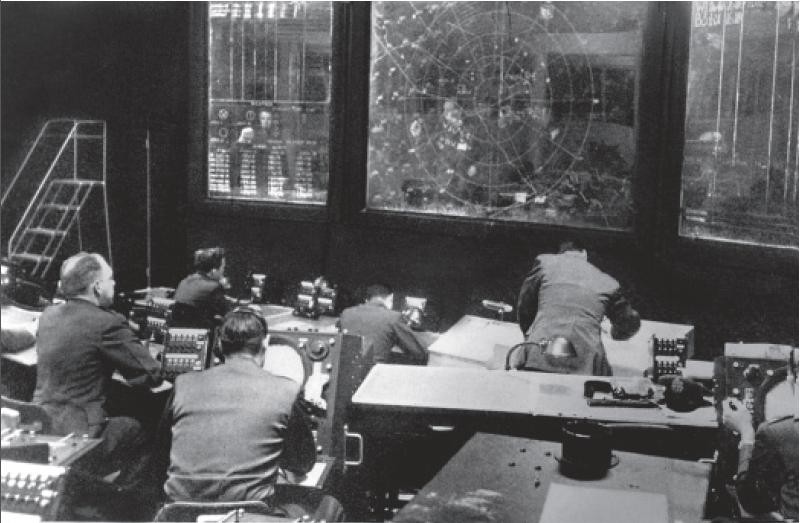 At the time of the lab’s foundation, RAND’s Electronics Division was expending a great deal of energy on the Air Force’s Air Defense System, a network of radar stations that would feed data on incoming aircraft to a series of Air Defense Direction Centers (ADCCs) where personnel would compile data, evaluate threats, and scramble interceptors as necessary to protect the integrity of US air space. With the Cold War entering its nuclear phase, perfecting the country’s Air Defense System was vital to insure long-range Soviet bombers could be intercepted before delivering a nuclear payload on American soil. According to Ware, Kennedy and his colleagues, most notably Robert Chapman, William Biel, Bogusław Boghosian, and Milton Weiner, were particularly interested in cognitive learning and how best to train organized groups that were required to coordinate their activities to carry out a larger task. As such, they were naturally drawn to the ADDCs and with the encouragement of Melvin Kappler of the Electronics Division chose as their first major study “Project Simulator,” an ADDC computer training program. According to Marzocco, the Systems Research Laboratory constructed a nearly exact physical replica of the ADDC located in Tacoma, Washington, along with partial replicas of three associated early warning stations. Ware relates that the system was constructed in a warehouse at 4th and Broadway in Santa Monica and was based around an IBM 701 that would run a simulation of incoming aircraft that the trainees had to identify, pinpoint, and interdict. The display consisted of a faux radar screen drawn by an IBM 407 printer that produced a new paper readout each time the radar changed. Marzocco tells us that the first exercise using the system, code-named “Casey,” ran from February 4 to June 8 1952 and involved twenty-eight students from UCLA. A second run, code-named “Cowboy,” followed in early 1953 with actual military personnel. According to Ware, the Air Force was so pleased by the initial results of Project Simulator that it decided to deploy the system across the service and funded a variety of improvements such as a high resolution camera from Mitchell Camera Company and a cathode ray tube (CRT) display for the 701 from IBM so a film strip could replace the paper readouts of the original system. According to Marzocco, RAND responded to the growing scope of the project by establishing a new System Training and Programming Division (quickly shortened to System Development Division) under Kappler in September 1955 to deploy the training system, which now went by the name “System Training Project” (STP). By May 1956, the division had installed the STP at seven Air Divisions. In December 1957, the division was spun off as its own corporation, System Development Corporation (SDC). While the STP appears to be the first military simulation run primarily by a computer, it cannot really be classified as a complete computer game, as the 701 merely plays the film and traces flight paths over a two-hour training session. A human team was apparently still required to actually administer the exercise and interpret the results. While a doctoral candidate in mathematics at the University of Cambridge in 1952, Douglas decided to develop a thesis concerning human-computer interaction. (NOTE: Some sources claim that this research formed the basis of his dissertation, but a quick look at the catalog of the Newton Library at Cambridge shows this is not the case. The program was, however, described in the dissertation, which is why we have such complete knowledge of it today.) Needing a platform to test the theories of his thesis, Douglas chose to program a naughts and crosses (tic-tac-toe to Americans) game for the EDSAC computer at the University of Cambridge. As will be discussed later, the EDSAC represented a landmark in computer history that pioneered several innovations. For the purposes of this post, however, the most important advance was the machine’s ability to display a map of its memory on a CRT as a 35 x 16 dot matrix. (Source: “A Tutorial Guide to the EDSAC Simulator” by Martin Campbell-Kelly) This feature was primarily used to help debug programs, but could also be used to create images on the monitor by manipulating specific dots on the grid. Douglas took full advantage of this capability for OXO. To play the game, one used a rotary phone dial connected to the computer. Each space on the tic-tac-toe grid corresponded to one of the numbers on the dial, so the player simply dialed that number to make his mark. Both OXO and Strachey’s draughts program sported relatively static graphics to convey the current state of the game board, but a more dynamic graphical game soon emerged from the University of Michigan. One of the lesser known hotspots for computer research in the 1950s, the university developed several analog and digital computers at an offsite laboratory located at the Willow Run manufacturing complex. Established by the Ford Motor Company in 1941, Willow Run initially built aircraft components before producing roughly half of the B-24 Liberator bombers that flew in World War II. After the war, an airfield built as part of the complex passed to civilian control, and the University of Michigan established a research facility there. This lab became involved in computer research in aid of defense projects ranging from air traffic control systems to the BOMARC (Boeing-Michigan Air Research Center) guided missile. According to a pamphlet by Norman Scott entitled “Computing at the University of Michigan: The Early Years Through 1960,” Willow Run built two digital computers in 1952, the Michigan Digital Automatic Computer (MIDAC) and the more advanced Michigan Digital Special Automatic Computer (MIDSAC). According to Scott, both computers were built by an engineer named John DeTurk and derived from the Standards Eastern Automatic Computer (SEAC) built by the National Bureau of Standards in 1950. According to the June 27, 1954, edition of the Chicago Tribune, the Willow Run facility publicly debuted the two computers for the first time on June 26, 1954, which were both programmed to play games for the occasion. The MIDAC hosted a craps game that declared its “box point” and then rolled simulated dice until it won or lost, with the results printed on an automatic typewriter attached to the machine. 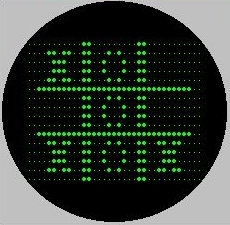 MIDAC also hosted a tic-tac-toe game that pitted a human against a hardware-controlled opponent. If a player attempted to cheat by placing multiple symbols on his turn, the computer would call him out for it. Unlike MIDAC, MIDSAC was hooked up to a 13-inch CRT display, allowing it to host a far more impressive game. According to a deposition given by a research associate at the lab named William Brown, he and a colleague named Ted Lewis were approached by DeTurk to create a demonstration program for the forthcoming event in early 1954 and suggested a pool game because they were both avid players and felt some form of game would be particularly interesting for the audience. Developed over the course of roughly six months, the program simulated a standard pool table and a full rack of fifteen balls, which two players would take shots at by controlling a two inch cue stick. The controls consisted of a joystick, which moved the cue stick around the table, a knob, which rotated the cue stick to choose the angle of the shot, and a button to actually strike the cue ball. The program subsequently performed 25,000 operations a second to determine the speed, trajectory, and bounce of every ball as they collided with each other and the sides of the table. Any ball that entered a pocket would disappear. Due to limited processing power, the sides of the table and the pockets were not actually displayed on the CRT, but instead were drawn in grease pencil on a transparent overlay. According to both the Chicago Tribune article and Brown’s deposition, the graphics updated seamlessly and gave the illusion of continuous movement, making the MIDSAC pool game perhaps the first computer game to feature real-time graphics. Despite its pioneering features, however, this game has yet to appear in any monograph of video game history. In his autobiography, Memoirs of a Computer Programmer (1985), EDSAC designer Maurice Wilkes briefly describes another early CRT game created on his pioneering machine by an enterprising programmer who manipulated the display to create a vertical fence with a single hole in it that the player could manipulate to appear on either the top half or bottom half of the screen. Periodically, a horizontal row of dots would appear and attempt to pass through the fence. If the hole was on the same half of the screen as the dots, they would pass through, otherwise they would retreat. Initially, the movement of the dots would be random, but the program was actually capable of learning so that if the player moved the hole according to a consistent pattern, the row of dots would eventually figure out the sequence and appear in the correct place every time. Wilkes provides no details on when this program was implemented nor who designed it, but he is quick to point out that “no one took this program very seriously.” This once again reinforces the idea that 1950s computer researchers like John Bennett and Alexander Douglas might have occasionally found games useful to prove a point, but had no real interest in harnessing computers purely for entertainment. Indeed, there is only one known computer game created in the entire decade that was designed specifically to entertain the public rather than test or demonstrate computer theories or train students and personnel, and it will be the subject of my next post.